After seeing many commercials promoting Maybelline's dark circle concealer, I decided to try it when it went on sale. I am trying to use my Max Factor Pan Stick sparingly, since it is no longer available in the US -- thanks P & G. Anyway, I have been trying out new concealers to see if I can find one that is comparable to Max Factors, which I know probably isn't going to happen. Have any of you US girls had any luck with purchasing Max Factor products online? I have been using this concealer for about a week now and I have mix feelings about it. I have followed the directions on the tube for how to apply it under your eyes and I still feel it doesn't make much of a difference and isn't anything special. Granted, I do not have a major problem with dark circles, I would still like to cover up what I do have and I don't feel this does any better of a job than other concealers. 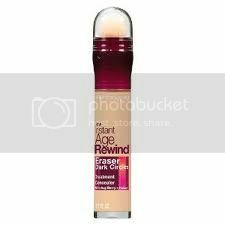 I do, however, think it is an excellent blemish concealer and this is what I have been using it for. I like the sponge tip that I can apply directly to my face, eliminating the use for a brush or my fingers. I haven't found this is be very long lasting. By the end of the day, I can see all the spots I previously covered up, which if I am spending $9 on something, I would hope that it would work, at least for the length of a day. I am going to use this up and probably never purchase it again. Any ideas on finding a good replacement for my beloved Max Factor Pan Stick? I have purchased the product discussed above and am not associated with Maybelline, nor was I compensated by any means for this review. This is my own personal opinion of the product. I used to love the Pan stick!! I've been using Revlon ColorStay foundation since April 2010 and like it well enough. I use a stipling brush to put it on because when I wear a full face of foundation, it's usually when I'm going out dancing and I want good coverage that goes on and stays on!! I have terrible dark circles under my eyes due to allergies and nothing helps much. I've been using Maybelline Mineral Powder foundation in a yellow/orangey color as my under eye concealer and it works okay, as long as I really moisturize first. I'm pale as a ghost so the dark eye circles really stand out. Also, I found this little gem at Ulta this spring and am IN LOVE with it. It keeps your eyeshadow on and in place until you wash it off!! It's probably the best $7 I've ever spent on makeup! I'm glad you reviewed this, because I have hereditary dark circles, so I'm always looking for something to help! Now I won't waste my money. Excellent product review you share. It’s pretty good information about how to remove dark circle around the eyes. It’s really helped me. I am waiting for your next remedy.